Remember when some anonymous Sequoians put a "bomb" from a military surplus store under the bridge in the Japanese Tea Garden and the school was evacuated? It wouldn't be a mere prank these days! 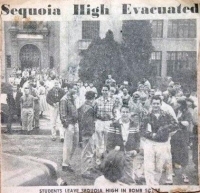 Bill Moll sent the newspaper picture of this event. He also sent the McKinley graduation program as well as other items including class pictures from McKinley - kindergarten, first grade and 7th grade. Bill's new items are the first and last entries in the photo album "Memorabilia Classmates have Shared." And for more such items, see the albums called "When We Were Young" and the one called "Sequoia Times." Thanks Bill (and the others before him) for what you sent. Does anyone else have something to share?